We carry a large selection of natural coconut 1/2 shell cups. These can be used for ice cream, sorbert, gelato, and other foods as well as candles, soaps, decorations, and craft projects. Coconut shells can be used in so many ways, it's no wonder that some people from Asia refer to coconut trees as the tree of life. Useful, decorative, and affordable are a few words that can accurately describe the nature of coconut trees and shells. Coconut 1/2 shells come in three sizes. Small: approx. 3" x 4" (approx. 4 oz). $62.50/box 250. Standard: approx. 4" x 5" (approx. 5 oz). $50.00/box 200. Large: approx. 4 1/2" x 5 1/2" (approx. 6 oz). $43.75/box 175. Coconut 1/2 shells with sanded bottoms come in three sizes. *Great for candles or liquids. Small: approx. 3 1/2" x 4" (approx. 4 oz). $75.00/box 250. Standard: approx. 4" x 5" (approx. 5 oz). $60.00/box 200. Large: approx. 4 1/2" x 5 1/2" (approx. 6 oz). $52.50/box 175. Why use metal or plastic? Try using natural spoons! 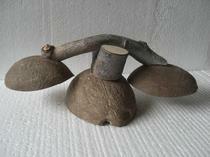 think how useful coconut shells can be.